From Realtime Gaming comes another fun-filled and exciting slot game called Tiger Treasures. This 5-reel and 20-payline video slot features a wild icon, scatter wins, progressive jackpot and free spins. Players from the US can also enjoy Tiger Treasures through Rushmore Casino and Aladdin's Gold Casino. While the tiger is the main star in Tiger Treasures, the main theme revolves around a Chinese jungle. Other symbols in the game are a monarch butterfly, a panda, sapphire, orchids and ruby. The Chinese logo symbolizes the scatter. Players can also see an ace, jack, nine, ten, king and queen symbols on the reels. To get started, use the up and down paws located on the bet section to place in your bet. You can choose between the following: ?1, ?2, ?3, ?4, ?5, ?6, ?7, ?8, ?9, ?10, ?25, ?50, $1, $2.50, $5, $10 and $25. To set how many paylines you will activate, you can use the paws located near the "Lines." The lowest total wager you can place is ?1, while the highest is $500. With this much difference in the betting range, the game accommodates all kinds of bettors. Simply hit the "Spin" button to move the reels. The tiger icon, which is the wild, exclusively appears on the fourth and second reel during the regular round. The tiger being the wild means it can replace other symbols to make winning combinations, with the exception of the scatter symbol. The tiger will multiply your bet three times if you formed a winning combination. The biggest jackpot in this video slot is 4500x of your bet in every line. To win this grand prize, the tiger has to be paired with either the sapphire or the ruby. If the tiger doesn't appear anywhere on your reels, it's still a good day as getting a sapphire or ruby means your bet per line will be multiplied by 1500x. If at least three scatters appear on the reels, you will be rewarded anywhere between 5 and 25 complimentary spins. 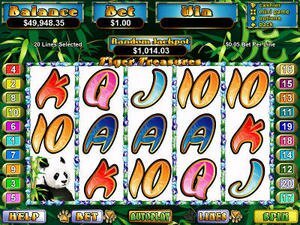 On the free spins, the tiger will be placed on the third reel and more tigers would be added on the second and fourth reel, giving the possibility of another round of free spins. The free spins is among the many ways you can win big in Tiger Treasures.